Rwanda's couples’ voluntary HIV counseling and testing (CVCT) initiative has been coordinated through Project San Francisco, established in Kigali in 1986. Photo courtesy of RZHRG. A 30-year HIV prevention and research initiative in Rwanda has resulted in the prevention of more than 70 percent of new HIV infections in that country. Rwanda is the first African country to implement Couples’ Voluntary HIV Counseling and Testing (CVCT) as a nationwide intervention and a social norm. The program includes the Rwanda Ministry of Health, Emory University, and the Centers for Disease Control and Prevention. An article published online in the Journal of AIDS reports on the 30-year history of CVCT in Rwanda and Zambia. In Rwanda, more than 90 percent of new infections occur in cohabiting couples. CVCT provides both partners with the opportunity to share their HIV test results, jointly address issues related to HIV transmission and family planning, and support each other if one or both are infected. CVCT is also associated with an increase in interventions to reduce mother-to-child transmission and a lower risk of HIV infection in infants born to HIV-positive mothers. The World Health Organization (WHO) recommends CVCT as an intervention for prevention of heterosexual HIV transmission. Approximately 70 percent of the 35.3 million adults and children living with HIV worldwide as of 2012 reside in sub-Saharan Africa, where the majority of new adult infections occur through heterosexual transmission. However, outside of Rwanda very few African couples have received CVCT as an intervention. "The majority of adults are either unaware of their own HIV status and/or that of their partner, and in many cases adults do not know that it is possible to have a long-standing partner with a different HIV status," says author Etienne Karita, MD, MSPH, director of Project San Francisco. Rwanda is the first African country to have established CVCT as standard of care, with approximately 88-90 percent of married men and women tested as couples. More than 20 countries have sent providers to Rwanda for CVCT training. 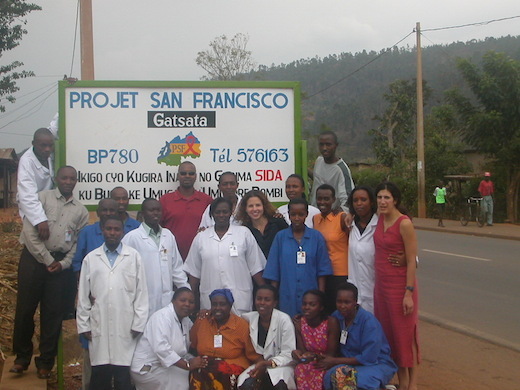 The CVCT initiative has been coordinated through Project San Francisco, a research organization established in Kigali, Rwanda in 1986 as a collaborative program with the Biomedical Center of the Ministry of Health. Together with its sister organization, the Zambia Emory HIV Research Project, it forms the Rwanda Zambia HIV Research Group, headquartered at Emory University. The U.S. Centers for Disease Control and Prevention (CDC) office in Rwanda funded the training and technical assistance components of nationwide CVCT implementation. "Through research, collaboration among international organizations, government, and academia, and despite the challenges of war and poverty, our consortium has persevered to implement CVCT, thus preventing HIV, saving lives, and changing public health practice in Rwanda," says Susan Allen, MD, MPH, professor of pathology and laboratory medicine at Emory University School of Medicine and Rwanda Zambia HIV Research Group. "Now we must take the steps required to expand this success throughout sub-Saharan Africa." The authors note: "Separate HIV testing of women and their partners is a missed opportunity. It is notable that International agencies tasked with HIV prevention programs in Africa still do not include CVCT among their indicators. In Zambia, 9 of 10 new infections in women come from their spouses. Testing pregnant women with partners at the first ANC visit has the advantage of identifying discordant couples and thus likely preventing infections in mothers and fathers. In contrast, individual testing targets prevention only to newborns." To duplicate Rwanda’s success, they say, training and technical assistance must be part of a coordinated effort to set national targets, timelines, indicators and budgets. Governments, bilateral and multilateral funding agencies must jointly prioritize CVCT for prevention of new HIV infections. Government support and collegial relationships among research, government and implementation sectors have been important factors in Rwanda’s success in coordinating policy, funding, promotion and service. In addition, Rwanda’s small size, dense population, good transportation and communication infrastructure, and homogeneous language have helped facilitate rapid implantation of CVCT. Despite demonstration projects and advocacy in Zambia supported by international development agencies from Canada and the United Kingdom, the effort has never reached widespread success as it has in Rwanda. Possible logistical factors cited by the authors are larger surface area, diversity of languages, lack of knowledge of HIV discordancy, and lack of disclosure of test results to cohabiting partners in Zambia. Most importantly, endorsements from the Government of Zambia have not led to adequate and consistent funding for CVCT. "Although since 2013 the WHO has recommended treating all HIV positive people in discordant partnerships with antiretroviral drugs to prevent transmission to partners, this recommendation cannot be successful until CVCT is effectively promoted and adopted in HIV prevention programs, with adequate funding, say the authors. But even in areas where ART is not available, CVCT can have a considerable impact with low cost." The study was funded by the Centers for Disease Control and Prevention (U2GPS001839, U2GPS1839, U2GPS1904), the National Institute of Allergy and Infectious Diseases (R01 AI23980), National Institute of Mental Health (R01 MH66767, R01 MH95503), National Institute of Child Health and Development (R01 HD40125, R01 HD072659), Emory AITRP Fogarty (5D43TW001042), Emory Center for AIDS Research (P30 AI050409), and the International AIDS Vaccine Initiative. (SOW2166).